Looking for an exotic popsicle to quench your thirst? 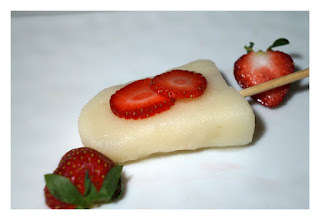 Try this delicious Litchi Popsicle recipe from Oceanique in Evanston. Put litchi puree, lemon juice and sugar in a blender for one minute. Taste and adjust with more sugar or lemon. Pour into popsicle molds and freeze for 2-3 hours, or overnight until solid. Dip molds in warm water bath for 10-15 seconds and remove popsicle from molds. Put back in freezer for 15 minutes to set up fully. Serve with fresh local fruit such as peaches, strawberries or raspberries. Garnish with fresh mint or lemon balm.